Turmeric is a “super spice” in my book, with health benefits that are vast and various. While I’ve been cooking with it for years, I just recently started adding it into my smoothies, with much success. Here’s why “hiding” a little turmeric in your smoothies is such a great idea. Potent Anti-Inflammatory – At the root of most health issues you’ll find inflammation, whose reduction goes along way in alleviating symptoms. Aids Weight Loss – By helping increase the flow of bile, an important factor in digesting dietary fat. Also helps the liver detoxify. Anti-Cancerous Properties – Turmeric helps prevent and destroy cancer cells. Powerful Antioxidant – Potent free-radical quencher. Anti-Bacterial, Anti-Viral, and Anti-Fungal – Perfect when colds or the flu strike. Skin Health – Promotes healthy skin and can reduce skin problems. Helps With – Turmeric has been implicated in helping relieve and stave off: Alzheimer’s disease, arthritis, asthma, cancer, diabetes, and depression. Curcumin is the active ingredient in turmeric responsible for much of its health promoting properties, in case you were curious. Turmeric has a slightly bitter taste. By blending it with sweet fruit and/or a sweetener and not using a ton, you won’t even notice it in your smoothie. I used turmeric from a spice bottle, but fresh turmeric will work just as well. Enjoy! Place all the ingredients into your high-speed blender and blend for around 30-45 seconds or until nice and smooth. If you don’t have a very powerful blender and your coconut oil is in liquid form, you might want to blend everything except the coconut oil first, then drizzle it on and blend for another 5-10 seconds to avoid clumping. Let me know what you think of this tasty tropical turmeric smoothie by leaving a comment below. Happy Blending! I just made this smoothie (I am addicted to smoothies!) and it is amazing! But, why the coconut oil? Hey Angie, I’m glad you liked this smoothie, thanks for sharing. I have a “healthy” addiction to smoothies too :) The coconut oil adds a little healthy fat in a form that’s easy to digest and use for energy. Coconut oil is also good for digestion, especially fat soluble vitamins, good for the immune system, rich in antioxidants, good for your hair, skin, and cardiovascular system – basically it’s a superfood. I use copious amounts of coconut oil in smoothies and cooking in general. Coconut oil is the single best oil you can consume. Without using long words that most people do not understand, it simply is the most easiest oil to for your body to absorb either orally where it does not require help from the liver and it is simply passed into the blood OR through the skin. 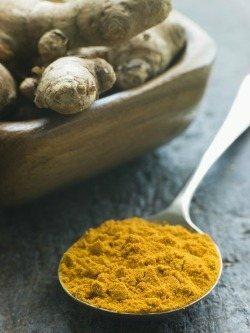 I stumbled upon your site from Google, I was looing for a recipe specifically a smoothie with turmeric and your recipe has all the ingredients I wanted to see including ginger! Holistically your recipe above is perfect for anyone who is not well or who wants to improve their health. I have someone who has cancer and I will use this recipe. Finally I might just add that you might want to show people how easy it is to make almond milk and how healthy fresh almond milk is. Cheaper than buying the “dead” almond milk in a carton. I couldn’t agree more on how wonderful and health promoting coconut oil is. I buy it by the gallon and use quite liberally, internally and externally. Was actually just reading about how the medium chain fatty acids in coconut oil are basically impossible for the body to store as fat, and perfect for energy production. Kudos to Google for leading you to my site, and this recipe in particular. I’ve been using more and more spices like turmeric and ginger in my smoothies for taste and health benefits. Coincidentally, a holistic practitioner friend of mine recently advised someone with liver cancer to start taking turmeric, and to drink kombucha (great for liver detox)…I supplied the scoby. I’ll have to put together a post possibly including a video showing people how to make fresh almond milk. You’re right about it being much better than anything you can buy in the store. Kombu and green tea in general are very good for health and excellent in treating diseases such as cancer. My mother inlaw has lung cancer and we are giving her tumeric and green tea amongst many other changes in lifestyle. Certainly, green tea might be an interesting base for a smoothie. I know the Japanese have green tea *everything* and this along with Soy products probably explain their low rates of cancer. Yes – contrary to popular belief – non GMO (preferably organic) say is not dangerous to our hormone levels. Being plan based, our bodies work with this plant based hormone in a similar way to our body works with vitamin D we receive from the sun (it stores it! until required or until it expires). However in your recipe above, the MACA powder is great for both energy and rebalancing hormones (in men too! think baldness! this is *often* hormonal). I hope and pray more people will find this wonderful site as I did and thanks to Google! I agree completely with you on green tea and its health promoting properties. There are currently three recipes on my site that call for green tea as the base of your smoothie, including one I think you’d like, Spicy Anti-Inflammatory Smoothie. It’s my understanding that fermented soy products such as natto, miso, and tempeh are perfectly fine, but unfermented, soy protein is hard to digest, and then there’s the problem with 90% of the soy being GMO here in the US. Thanks for the kind words about my site. It’s been a labor of love. I still have loads of content to add, when I find the time of course. I would like to know how to make fresh almond milk. Awsome! Hi Kim and any others interested in making your own fresh almond milk. It’s really very easy, so here we go. 1. Soak 1 c organic raw almonds in water overnight (to sprout). 2. Rinse the nuts well, then pop off the skins which contain digestive enzyme inhibiting tannins. Rinse again lightly. 3. Blend the almonds with 4-5 c water (depending on how creamy you like it) in either a Vitamix or a blender. 4. Place a sieve over a bowl and line it with cheesecloth. 5. Pour the milk through the sieve slowly to avoid overflowing. 6. After all the milk has been poured through the sieve and into the bowl, pick up the cheesecloth and squeeze the residual milk through it. Voila – fresh almond milk. * You can add special flavors such as a dash of vanilla, maca powder, cacao powder to the milks. The shelf life is about 5 days. ** To be even more economical and if you follow a gluten free diet, you can take the almond pulp, dry it in a dehydrator, then blend it in a Vitamix or blender and you will have almond flour! You can do a smilar process to make your own coconut milk (DELICIOUS!!) which avoids all the gums, thickeners and stabilizers on the store shelves AND it’s fresh! You can’t beat that. Thanks Ryan, too, for this recipe!! I’m so excited to have found a delicous smoothie recipe with all these elements. I’m looking forward to ‘staying tuned’ for updates! I agree so much with your philosophy on taking care of the body with the best nutrients possible! Hey Sandra, I’ve heard that as well. Both are anti-inflammatory and good for the brain. Just tried the Turmeric Smoothie, and I thought it would be bitter but its fantastic, I have gained weight for no apparent reason, I eat healthy and my doc says my blood is good, were not sure what has triggered the weight gain but I am hoping these shakes everyday will help my metabolism and energy levels rise. Glad you liked this smoothie. Good luck with boosting your metabolism and energy levels! Well guess what. I tried it last night and got up this morning with no elbow pains. Thank you Almighty God. And thanks to Ryan. I am new to the benefits of turmeric. Other articles I have read say that it is necessary to heat the turmeric with oil to maximize absorption. What is your position? Is there a minimum recommended amount to use daily? Consuming turmeric with an oil does increase absorption. Consuming turmeric with black pepper also increases it’s bioavailability. I’m not aware of a minimum recommended daily amount. I just tried it and I AM IN LOVE!! I have a great idea for a holiday version. Add 1 cup of pumpkin pie filling as well as another 1/2 cup of coconut milk. I like your idea for a holiday version, Matt. Sounds divine. I am new to all this but I’m loving it!! I have a question can I used this smoothie as a meal replacement? Yes, this smoothie can be used as a meal replacement. If it’s no filling enough or doesn’t keep you satiated until your next meal try incorporating a few of the add-ons. coconut oil has been demonstrated to be a superior brain food. Fresh ingredients are preferred. However, powdered spices are nearly as a good and still a great option. Go with whatever is most convenient/accessible. The coconut oil makes the turmeric more bioavailable. Otherwise you really don’t absorb enough to be therapeutic You should also add some good quality freshly ground pepper from the whole peppercorn to boost the absorbability the most! Just made this for my hubby- who has tingling joints – inflammation I am pretty sure – love it :) thank you – for finding another way to get this super food in him! Awesome! Glad you found another (delicious) way to get more turmeric into his diet. I’ve been sprinkling it on my scrambled eggs lately with black pepper – the two compliment each other very nicely and potentiate the health effects of each. Just tried this smoothie with fresh turmeric and fresh ginger. Just great! Ryan – I have heard that turmeric only helps with inflammation if it is heated. Is that true? Should the coconut oil be heated before adding it to the smoothie or will it be chopped up as the smoothie gets blended? Hi Jessica, no need to heat the coconut oil. Although if it’s liquid I would avoid it coming into contact with the frozen mango chunks. Might want to blend everything, then add the coconut oil last to avoid clumping. Cheers! This smoothie is really good! Thank you for posting!!! My 8 year old really liked it too! I have a neighbor who is going through chemo and I thought I could make a few ready to blend packs of your smoothie and freeze it. So, when she wanted to have one she could just put it the blender. Do you think all these ingredients would freeze ok? Brilliant substitution, Candice! I love macadamia nut oil. Since I have experienced a second attack on my health I have since then become addicted to smoothies. In any given month if I miss making them five times that is too much. I have tried the tumeric and I must say I do love it. I even find my skin tone seems more rich although am black over the years I became a bit paler. I have even gotten a few of my co-workers to the smoothie world. And they have had remarkable results. Even my son has to. Coconut oil is amazing when I took a tbsp in the morning the energy I had for the day was amazing. But after reading about eating for my blood type this is not recommended but I still use in moderation. Do you use extra virgin coconut oil? Where do you buy from? I do use extra virgin coconut oil and buy it by the gallon from Mountain Rose Herbs. Wow. I just had to write to tell you this may be the best smoothie I’ve ever had. I found this from googling ‘turmeric in green smoothie’. I was actually looking for something that incorporated turmeric and coconut oil since I knew they went to well together and have read that coconut oil had many health benefits of its own along with increasing the bioavailability of the turmeric. Even though that’s not what I typed in for my search, I guess google read my mind. I bought a vitamix in April and have become hooked on green smoothies, having one almost daily for the last 8-9 months. I rarely follow recipes anymore, as I’ve grown accustomed to various ingredient combinations and can concoct a smoothie in my sleep. I’m so glad I stumbled upon your recipe! I’ve been looking for a way to add turmeric into my daily routine and I just can’t thank you enough for this deliciousness. Cheers! I love hearing about people who’ve jumped on the healthy smoothie train and haven’t looked backed. Good for you! Following recipes is necessary when you get started, but once you get the basics down creating your own unique creations is what it’s all about. To your continued smoothie success! Your version of this smoothie sounds fantastic! Great to hear you enjoyed it and are now incorporating turmeric and ginger into your smoothies. Loved it! I included chia seeds & kale. Awesome, Rachel! Can’t go wrong with chia seeds and kale. Oh my goodness!! I just made this drink for my mom and she loved it!! Absolutely amazing smoothie and the ingredients are super duper healthy.. Finally found a way to consume turmeric without gagging!! Just got a good injury, and was looking for something quick to get some turmeric in. Googled “turmeric coconut oil smoothie”, and got this page… Wow! That was delicious. Going to explore your site some more. Where can i purchase high quality turmeric? Your local health food store should carry organic turmeric powder/spice and organic turmeric root. I see I am not the first to really enjoy this recipe. I want anything that will help my arthritis and pain so turmeric and ginger are recommended. In fact I would like to use either one or both in most smoothies. Any chance a 1/2 teaspoon might work with most smoothies? The key is to mask the taste of those spices with other ingredients if they’re not pleasing to your palate. Yes, 1/2 teaspoon is the recommended amount and should work with most smoothies. Everyone’s taste preferences are different so you’ll have to experiment and find what works for you. So good! Made another one this morning after my run, this time added half an avocado. This may be my new favorite smoothie! Mask turmeric’s flavor?! You’re nuts! Like all spices, the flacor’s fantastic! Of course, it is best enjoyed in moderate to small amounts, like any spice. I suggest you learn to appreciate the flavor rather than mask it. I happen to enjoy and appreciate the flavor of turmeric (and ginger), but not everyone does. My advice to mask the taste of those spices with other ingredients is aimed at people who they’re not pleasing to the palate of; so they can still reap their health benefits. I make my own almond milk but have never heard of removing the skin prior to blending. I use a nut milk bag to strain the milk. Wouldn’t the (nylon) nut milk bag capture the skin residue? I imagine it would be quite a tedious process to remove all the skins! I too was looking for a smoothie recipe that included turmeric but my question is can you use raw turmeric or does it need to be cook first? Another query re coconut oil….do you melt this or place it in your smoothies solid? I’m currently using a product called “MCT”, derived from coconut oil but has some other stuff in it as well but it’s liquid, as a source of dietary fats for my smoothies (as well as either chia, hemp seeds, flaxseed oil). I’ve heard that coconut oil can make the smoothie lumpy but wasn’t sure if this was melted coconut oil or solid. I should have mentioned only use the skin of turmeric if it’s organic. The consistency of my coconut oil depends on the temperature. It’s usually solid, which actually blends better in my experience. Above 76 degrees it’s liquid, in which case I recommend you blend everything except the coconut oil first, then drizzle it on and blend for another 5-10 seconds to avoid clumping. Hi Ryan, Wow!!!! this smoothie is fantastic. I make green smoothies every day for me. I have been getting your smoothie recipes for a while, but this is the first time I make one that I got from you. I loved it! my bananas and mango were frozen I added 1/3 cup shredded coconut and 1 Tbsp. Maca, I had to add a bit of water because it was so thick my Vitamix would not mix it. Thank you for sharing this delicious smoothie. I am sharing this one with my daughter that now is getting radiation treatment. God bless you. Great to hear you enjoyed this smoothie. It’s become a fan favorite. Your daughter is lucky to have you on her side. Do you happen to have the nutritional info on this recipe as well? Thanks! Ask and you shall receive :) Nutritional info was just added. Hey! Is it alright if I add double the amount of turmeric to the smoothie? Yay :) I am enjoying it almost every morning. Cheers beautiful soul! Hi Ryan.. What if you are not a coconut fan? Any other suggestions? Thank you! I’m also going to share this with my friend that has cancer. Substitute your preferred milk or water for the coconut milk. Butter and ghee from grass fed animals is the next best thing to coconut oil. Or you could substitute a little avocado for the coconut oil and still get some healthy fats. I have used coconut oil to get regular – will the addition of this not cause the same effect ? Hopefully the amount of coconut oil in this smoothie doesn’t have that effect. If so, try using 1/2 the amount called for. My sorority sister shared this exact recipe with me today, so I looked on Google to find out how much to use of the ingredients and found your recipe for the Tropical Turmeric Smoothie. I love it! I’m also learning so much by reading all of the comments. Thanks, Ryan! Thank your sorority sister for me :) Great to hear you love the recipe and are learning more about smoothies and health! I love this smoothie. Can I use fresh tumeric root instead of the powder? I’ve got a vitamix. Sure you can use fresh turmeric, Lola. Wash and toss a small chunk into your Vitamix, which will pulverize it. Absolutly delicious! I love this smoothie and i blend him everytime i want to boost my immunity! it has special taste and apart flavour! I love the taste of fresh turmeric. I bought a large organic quantity a couple months ago, pureed and put it in the freezer. It really comes in handy. I made this with fresh turmeric and ginger. I was craving something for dessert. An extra touch of raw honey and a half scoop of protein powder and it hits the spot! Fresh turmeric is something special. Pureeing and freezing is a great idea. I like how you adjusted this smoothie and made it dessert worthy. I like this recipe by adding 1/2 cup pineapple but also wanted to know if ok to use a handful of spinach/kale and some flax or hemp seeds? If I wanted to make it for 2 servings just add another cup or more of almond milk? Sure you can add a handful or spinach or kale and some flax or hemp seeds. I would double the amount of each ingredient for two servings. I really like how you respond to people comments and I think you do a really good job. So I feel like I am going to ask a really dumb question here, but about the add-on ingredients, is it chia seed OR pineapple OR avocado etc or is it ALL of them? Just would like to mention that if you add honey better make it raw honey as it is alkaline. Otherwise processed honey is acidic and therefore inflammatory, so you end up sabotaging the wonderful anti-inflammatory properties of the turmeric and cinnamon!. I also would like to mention that coconut oil is excellent for weight loss! That’s actually a great question. The add-ons are completely optional. You can add just one or all of them. That goes without saying regarding raw honey. I’ve mentioned that somewhere on my site :) And yes, coconut oil is an excellent tool for weight loss. I tried this smoothie for the first time – it tasted awesome! You can taste the kick from the ginger. I will try to have one of these at least twice a week. Where does the 27 grams of sugar come from? How can I tweak it to reduce the sugar content? The bulk of the sugar is from the banana. You can try 1/3 avocado instead. I’m not a huge fan of mango. I’ve heard that pineapple is really good for those with RA (I’m just recently diagnosed). Could I substitute the mango with the pineapple or will I be losing the health benefits you discuss above? Pineapple is a great substitute for mango and you won’t be losing any health benefits. I really love all your recipes, you have worked hard to put all these together. I made the turmeric one tonight, I found it was a little too thick, so I added some coconut water to it, still turned out thick like a smoothie should, and yes, you have won me over, I have put my family and friends onto your recipe page. Fantastic job Ryan, thank you ever so much. I’ll be using a lot of these recipes especially weight loss and inflammatory one, but they are all great. I also love all the comments from people. Thank you for the kind comment, Gaylene, it brought a huge smile to my face :) It’s comments and emails like this that keep me going when I don’t feel like putting in time on my smoothie site. Let me know if you have specific smoothie questions. In the meantime, keep enjoying the smoothies and achieving your health goals. Thanks for sharing my site with others! Quite a bit of sugar…27grams! How can I cut back the sugar content in this smoothie? The banana is the leading source of sugar. You can use 1/2 banana, omit, or substitute with 1/2 avocado. Also, while browsing other replies and responses, I came across the site you order the coconut oil and was wondering which one you purchase, also, the essential oils on the same site, are they pure? Are they better than the so called member essential oils? Thank you so much for posting this smoothie!!!! It’s very healing to the gut. The GAPS diet is also worth exploring, a gut healing diet. I recommend Mountain Rose Herbs (Coconut Oil Unrefined – also Virgin) and Tropical Traditions (Gold Label Virgin Coconut Oil). Both are top notch. Mountain Rose Herbs essential oils are high quality. Hi there, I am so gonna try this. When is best to have this smoothie??? First thing in the morning with an empty estomach or what??? You can have a smoothie anytime of the day. That said, I recommend smoothies for breakfast. Always on an empty stomach. Hi Ryan, is it true that Tumeric is best absorded by the body when mixed with black pepper??? And do you have any Récipe with those two??? That is true, Edgar. I don’t have any recipes with turmeric and black pepper. However, you’re free to sprinkle a little black pepper into any smoothie with turmeric. I have a chronic skin condition called Hidradenitis Suppurativa there is a lot of inflammation and pain involved. I was looking for smoothie to try with some of the items that help inflammation and this one seems to have all of them. I have one quick questions, Is there another liquid I can use instead of milk? You can use water or your favorite herbal tea instead of milk, Michelle. If I decide to use fresh ginger and turmeric as opposed to the powder, how much would you recommend of each? Thank you. About a half teaspoon of each, Thomas. Hi just wanting to know. I suffer with ulcerative colitis and eczema/psiorsas will turmeric help with these?? I stumbled across your smoothie receipe tonight and just have a question? When u add the carbohydrates and fat together it adds up to a lot of fat in grams. Does this not contribute to causing high cholesterol? Just has me somewhat worried about that. Thanks! Hi …I just realized that I got mixed up lol …..its carbs and sugar that give the total amount of sugar. Check out my article on healthy fats, where I break it all down. Just made the tropical tumeric smoothie for the second time. Added a few frozen blueberries-this smoothie rocks! My absolute favorite and coconut oil makes it so creamy! Can’t wait to try more add ins, it’s heavenly addictive with no guilt. Both my stepsons wanted some. Thank you soooo much! I love how you added the coconut for additional healthy fat to the smoothie. I love smoothies so much that I make them for breakfast. Thank you so much for this recipe. I recently just bought turmeric. I will surely make this. I have never tried turmeric smoothie, I have been drinking turmeric because of its health benefits but having a hard time to finish in one seating as the flavor is too strong. Ill try this out today, this looks easier to drink than my usual.